Rfotofolio is pleased to share the work and words of photographer Amy Kanka Valadarsky. I was born in Romania, grew up as an only child in a family that was strongly rooted in the Jewish secular Eastern European culture. Discipline, the importance of studying and economic independence were like mathematical axioms – indisputable, self-evident truisms. Art was appreciated as part of a necessary general education, but not as a profession. To make a long story short, we moved to Israel; I became a software engineer, spent 25+ in the business world until in 2014, at the age of 50, I decided to leave the comfort of the known and explore my creative side. This coincided with a three years re-location to the US that opened up a whole new world of possibilities. Around 2011, with the big ‘50’ looming on the horizon, I decided to do something about my work life balance. At that time, I was working long hours as a senior manager for an international hi-tech company, doing very little beyond software projects. Browsing the web for interesting things to do, I stumbled upon an online jewelry class, read the syllabus, and a few minutes later I was enrolled. One of the class assignments required to open an ETSY store and display our designs on the web. Armed with a small point and shoot camera I snapped a few photos of the glass bead necklaces I was working on. Really bad photos. For the next year, in parallel to the regular day job and evening studies of metal arts, I kept photographing for my ETSY store, striving to create better images. Looking back, I know now I was searching for a visual language that will allow me to express myself. Thousands of bad photos later, a few good ones appeared, and I started to experience the camera as a powerful, expressive tool. In 2013, I left the hi-tech world behind me, and while I continued to create jewelry for a while, my focus slowly shifted towards photography. The first time I saw Sally Mann’s “Deep South” series was in my very first photography workshop. They took my breath away. They still do. Beneath the incredible beauty of the images, I sensed something more. The words to describe this invisible presence surfaced only months later when reading Sally Mann’s introduction to the series “The pictures I took on those awestruck, heartbreaking trips down south were pegged to the familiar posts of my conscious being: memory, loss, time and love.” Memory loss time and love captured through shadows and light. Besides Sally Mann, there are quite a few photographers and artists I admire. Minor White for his ability to “see what else is there,” Wynn Bullock – all his work but in particular his color abstractions, Nadav Kander (especially his Yangtze project), Keith Carter. Lately, I find myself more and more attracted to artists that expand the boundaries of photography either by digging at its roots such as Meghann Riepenhoff’s work or by combining photography with collage/mixed media such as K.K. DePaul. In the three years I’ve been photographing there were a handful of times when I literally “got lost” in the subject I was trying to capture. The only way I can describe these moments is that they are rooted in light, form, and meaning rather than in place, time and physics. Regardless of whether the resulting images end up being part of a body of work, these moments are truly priceless. 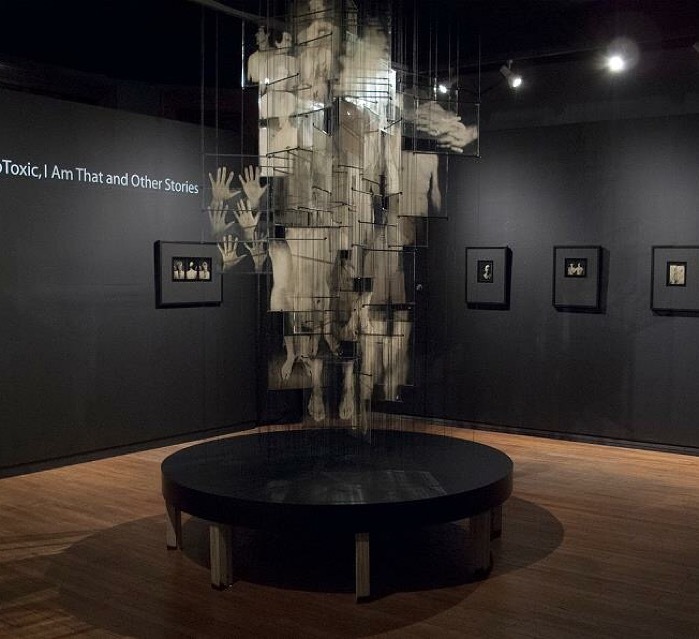 “Spirit and Dust,” explores the process of coming to terms with death and beyond. Symbolically, this is the first project I created in the comforting dim lights of the darkroom. “Spirit and Dust” started as much-needed outlet for feelings of disorientation and loss that followed the death of my mother-in-law, who was – and still is – a very significant person in my life. These images, allowed me to refocus on what remains rather than what was lost. I started by capturing on film forms of light symbolizing the eternal (spirit) and fragments connected to the cycle of life (butterfly wings, cracks, peeling bark) symbolizing the perishable nature of the body. These images were layered digitally and processed in the darkroom creating lith prints. What Image of yours would you say taught you an important lesson? Almost every body of work originated with a single image that defined its direction. In the case of “Spirit and Dust,” the defining image is the one that closes the series – “Acceptance.” The moment I saw it on my computer’s screen, I knew what kind of images I want to create. “Acceptance” was also the image I used for testing the possible printing options. When I saw the results of its first lith print test, there was no going back. The truth is that there is no piece of equipment so important that its absence will prevent me from creating. Having said this, the tool I seem to use regardless of the project I am working on is … my laptop. It is a great tool to research ideas and get inspired by other artists work as well as very useful when analyzing and playing with images whether captured on film or digitally and essential for organizing and exposing my work. Morning coffee while browsing emails/the web and finding something inspiring to read or listen to. Gardening/morning walk for the body as well as mind (it is amazing how much clearer ideas become after a good walk). Photographing/playing with my art journal/experimenting with images and to end the day, a glass of good red wine and a few episodes of “Grey’s Anatomy”. Having moved back to Israel after almost three years in sunny California, I plan to build my very own darkroom, continue to explore lith printing as well as start experimenting with chemistry and light. I plan to have a “wet studio” where I can play with Encaustic, combining photography, paint, and wax. And there will be the garden to provide materials for Anthotypes and photograms, did I mention I have a lot of plans? Thank you Amy. To learn more about the work of Amy Kanka Valadarsky please click on her name. So much I can relate to and magical images! Thank you so much for sharing.